Why is the number of “all time messages” only shown for room owners currently in the room? 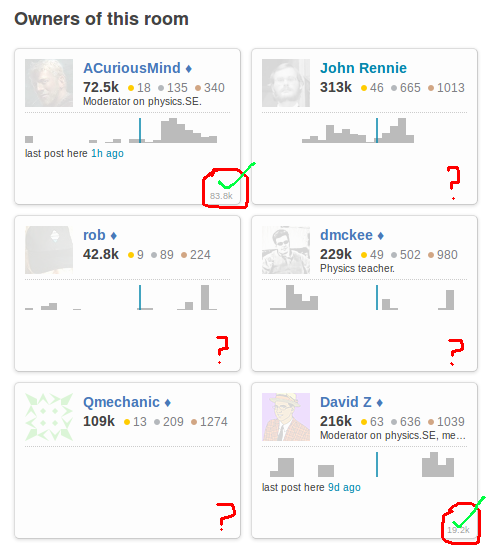 In the "Overview" of some of the Stack Exchange chat rooms, the number of "all time messages" is shown for some of the room owners and not shown for the rest. Here I can see 83.8k for ACuriousMind and 19.2k for DavidZ, and nothing for the rest. For a similar example, check out the SO Python room. Is this a bug? The room owners for which the message numbers are shown are exactly the ones that also appear in the list "currently in room" to the right. Okay, that makes sense now. But I still don't understand why the "all time messages" should be shown only for "currently in room" ROs. Is there any justification for this? Or is this an unintentional design flaw? Why do I keep being made a room owner for rooms made from moved messages? What the number of “all time users” of a chatroom exactly mean? Chat flags for room owners?